2013 German GP: Whats up with Romain Grosjean? Andrea de Cesaris's worst ever year in Formula 1 came in 1986 - a year in which he failed to score a single point. On the 13th April 1986, at the Spanish GP, Cesaris retired from the race with a differential failure on his Minardi. Four days later, young Romain Grosjean was born. Perhaps it was just an inauspicious time to make an entry into the world with dreams of becoming a racecar driver. You see, de Cesaris was already known as Andrea de Crasheris and would go down in history as the driver with the most race starts to his name without a win. Like Cesaris, Grosjean's also managed to earn himself a rather unfortunate moniker - 'first-lap nutcase' bestowed on him by Mark Webber after their crash at the Japanese GP last year. So it transpired that when Romain Grosjean made his way back to Formula 1 in 2012, he was the reigning GP2 and GP2 Asia Series champion. But the crashes continued, the nickname was earned and deserved and slaps on the wrist turned into a one race ban. The statistics, then. 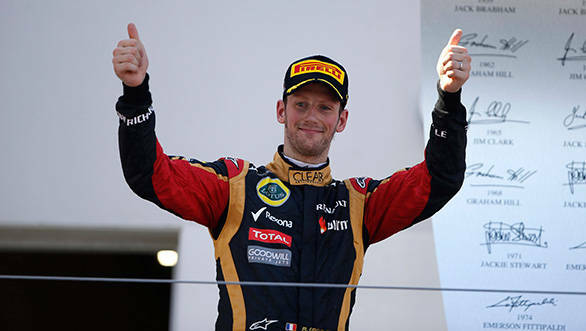 Of the 19 races he competed in in 2012, Grosjean retired from 7 and finished on the podium thrice. What had changed from that stunning GP2 season in 2011? Some said it was the pressure of competing in Formula 1, the pinnacle of single seater racing. Which is a little hard to believe, given that Grand Prix drivers are trained to accept and deal with the stresses of their jobs. Others believed that it was GP2 that made him the driver that he is - fast, with racecraft, but also overly aggressive and crash-happy. Indeed, there are other GP2 drivers who have been accused of similar driving styles - Kamui Kobayashi, Pastor Maldonado, Sergio Perez - and this seems a plausible explanation. Still more theories emerged though. Some questioned Grosjean's 'spatial awareness' stating that he wasn't inch perfect like other F1 drivers, and when you're racing at 300kmph, with three cars barreling down into the same spot, an inch is a whole lot of room. Whatever it was, by the end of 2012 it was clear that Romain had to either shape up or ship out. Lotus decided they'd retain him on a probationary contract, allowing them to replace him in the middle of the season if they needed to. Grosjean for his part decided he'd try getting things right and hired a sports psychologist to help calm him down. Of the 9 races so far he's retired twice, finished in the points thrice and had two podiums. A disastrous Monaco GP aside, one could say he's trying. Which brings us to this - why is Lotus still hanging on to Grosjean? It's no secret that Lotus is a team that's desperately in need of a title sponsor, and any money they get at this point is good. Total, who backs the team, wanted a French driver, a factor that helped RoGro's cause immensely. Nonetheless, it's not likely that they'd carry on with a driver who crashes endlessly. Lotus Team Principal, Eric Boullier, is a patient and clever man. He's the same man who created, for Kimi Raikkonen, an environment in which he could flourish, liberating the driver that other teams sought to stifle and giving Raikkonen the 'arrive and drive' sort of deal he was looking for. Perhaps Boullier knows with the right sort of encouragement, Grosjean really could target race wins in 2013 and hunt for the title in the future. Let's not forget that Seb Vettel had a couple of nasty prangs in 2010, the year in which he won his first title. Then there's the fact that Grosjean is a driver they've already invested in, and whether or not Raikkonen is in the team next year, they'll need a driver who is a known quantity. Drives like the German GP have proved that Grosjean isn't a number one driver yet, but he's certainly shaping into an able number two. Well, RoGro, you have a lot of hopes riding on your shoulders, now to bring back some of that GP2 magic.